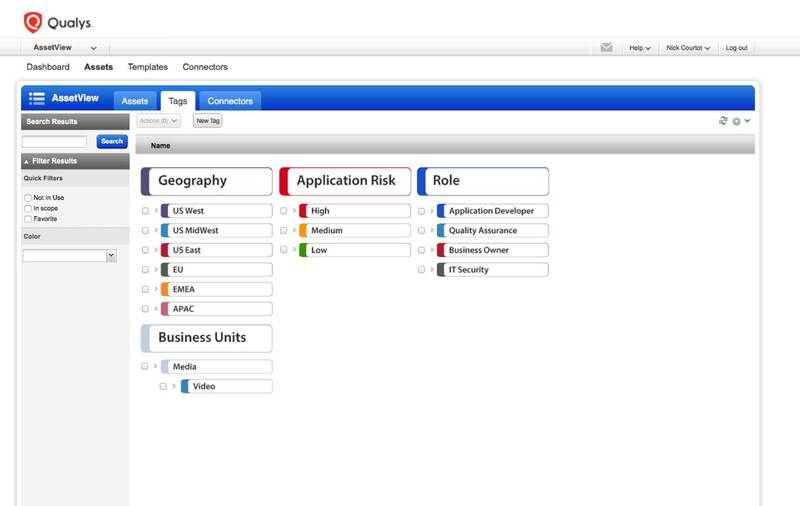 Asset Inventory | Qualys, Inc.
With 2-second visibility and 2-way synchronization with CMDBs. Asset Inventory constantly gathers information on all assets, listing system and hardware details, running services, open ports, installed software and user accounts. 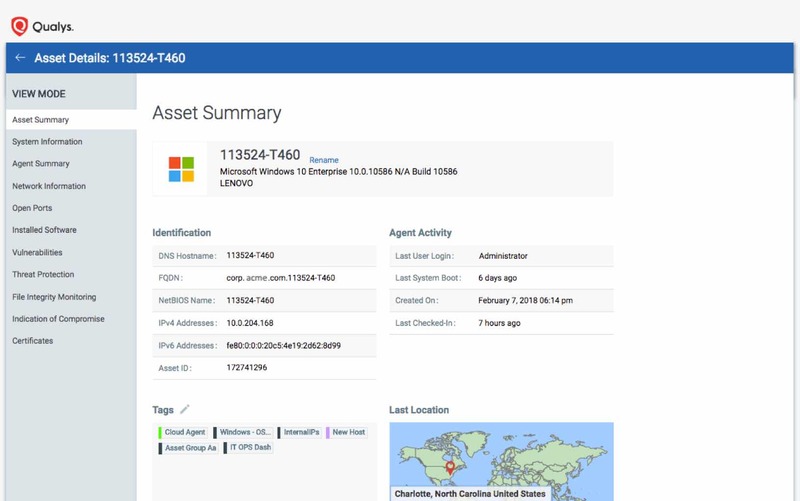 Asset discovery and inventory collection is done through combination of Qualys network scanners and Cloud Agents, which together can collect comprehensive data from across on-premises or cloud infrastructure as well as remote endpoints. A certified application synchronizes Qualys Asset Inventory data with ServiceNow’s Configuration Management system. 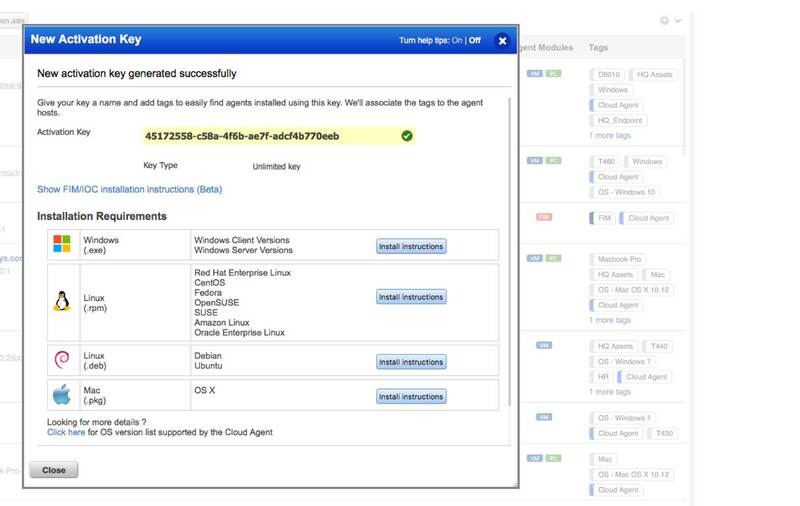 Device changes are immediately transmitted to the Qualys Cloud Platform and then synchronized with ServiceNow. For customers, this means an end to unidentified and misclassified assets, and to data update delays, all of which increase chances of breaches. With Asset Inventory, customers can make their asset data consistent and uniform, which is essential for having inventory clarity and accuracy. The product standardizes every manufacturer name, product name, model and software version by automatically normalizing raw discovery data, using Qualys’ ever-evolving technology catalog as reference. The catalog is continuously curated with a focus on completeness, relevance, and data quality. This process transforms the global IT asset inventory into multi-dimensional and structured information, so that you can make better business decisions. 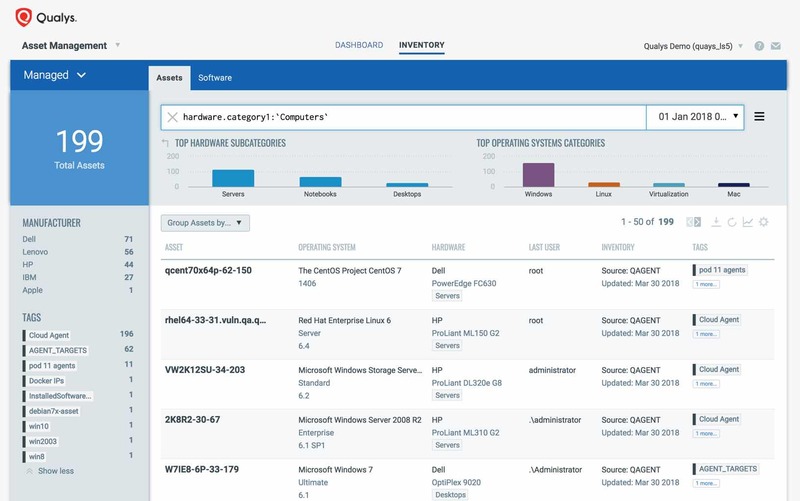 The Qualys technology catalog automatically extends your IT asset inventory with non-discoverable asset metadata, such as hardware and software product release dates, end of life dates, license categories, and more. These attributes provide IT organizations with multiple lenses that broaden asset visibility in new, meaningful ways. Teams can detect a variety of issues, such as unauthorized software, outdated hardware or end-of-life software, which can help you to properly support and secure critical assets. You can’t protect – or defend yourself from – what you don’t know is in your network, like unapproved devices and unauthorized software. 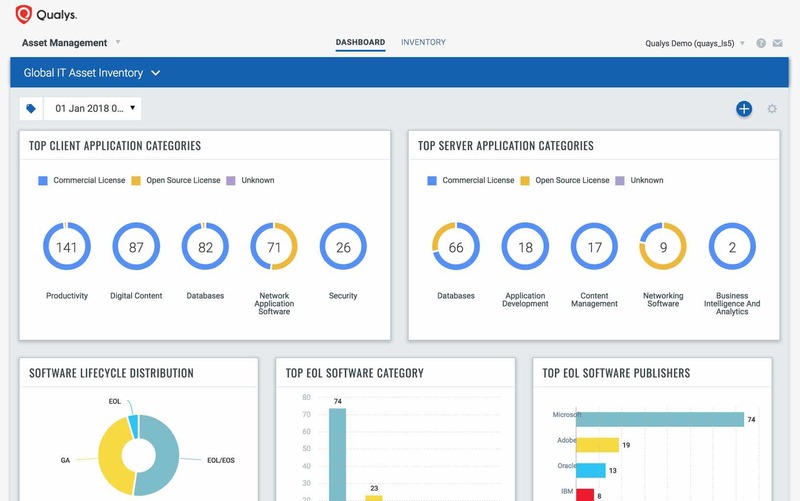 Qualys gives you full horizontal visibility of all hardware and software, scaling up to millions of assets – on premises, in cloud instances and mobile endpoints. How many PCs from a particular manufacturer do we have in our environment? Which servers are running an OS that its vendor recently stopped supporting? Which IT assets have a particular piece of software installed? How many databases are running in my data centers? How many Lenovo laptops running the latest version of Windows 10 and located in my India office have a particular vulnerability? Qualys gives you a multidimensional view of your global IT assets, allowing you to slice-and-dice their attributes and gain new perspectives that can help you make and expedite better business decisions. At the core, a normalization engine automatically standardizes virtually any meaningful IT asset data point. The normalization process is essential for accurate decision making. Manufacturer names, products, models, and software versions are standardized and structured. Acquisitions and product lineage are automatically accounted for. When viewing and analyzing software inventory, it is critical to differentiate applications from system software, since the former need to be managed and analyzed without the extra clutter of the latter. Asset Inventory automatically classifies all software, separating applications from system software, such as OS patches and drivers. Multi-level taxonomy is based on industry standards, careful analysis and curation. Every asset is classified in meaningful, functional categories based on hardware and software. The Qualys technology catalog automatically populates your IT asset inventory with asset metadata that can’t be discovered otherwise, such as hardware and software product release dates, end of life dates, license categories, and more. These attributes provide IT organizations with multiple lenses that expand asset visibility in new, meaningful ways. Not all assets carry the same weight within your organization. Asset Inventory lets you tag your assets, so you put relevant labels on them in the inventory and organize them in multiple ways. For example, you can specify which assets fall within the scope of PCI DSS (Payment Card Industry Data Security Standard) compliance. It’s essential to graphically display IT inventory data so that you can act on insights and prevent and address threats. 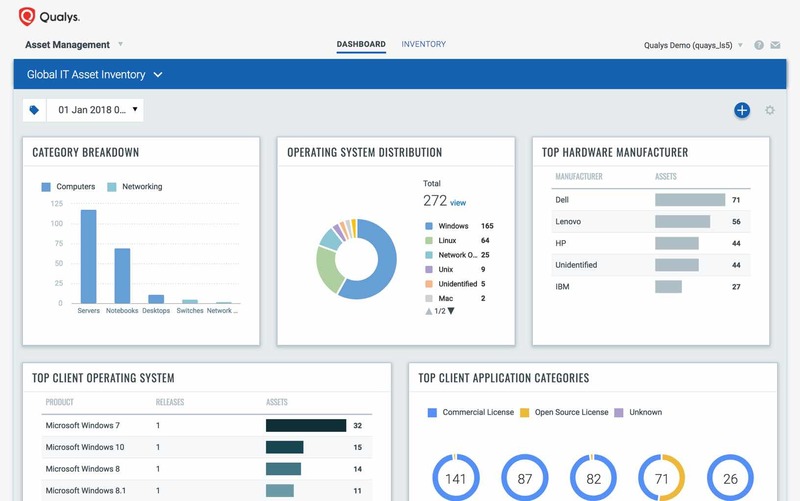 Asset Inventory’s interactive, customizable dashboard lets you visualize and share the security, configuration and compliance status of IT assets. IT asset inventory solutions must link up with your CMDB (configuration management database) and continuously feed it fresh, detailed data. That way, the CMDB can better illustrate and map the relationships, connections, hierarchies and dependencies among IT assets. 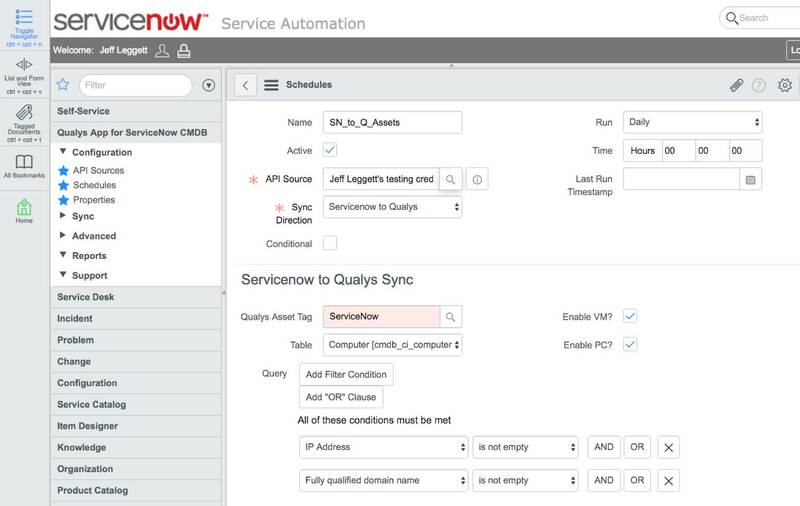 The Qualys App for ServiceNow CMDB syncs information about assets Qualys discovers into ServiceNow.